Provides Positive Cash Flow – Some multifamily properties return as much as 15% per year and rents typically increase 2-3% per year, adding more to your bottomline as time goes on. Allows Use of Leverage to Build Wealth and Maximize Profits – What’s better than using other people’s money to help acquire your asset, then using the tenants’ rent payment to pay back the mortgage? Appreciates – Real estate, especially in the right neighborhoods, has the potential to greatly increase in value over time. Allows Capitalization on the Increasing Demand for Rental Housing – Homeownership in the U.S. has been on a decline over the past few years and is expected to drop from 65% ownership down to 61% by 2030 according to Urban Wire. Although there are plenty of upsides to owning an apartment building, it also has its disadvantages. First off, a sizable upfront investment is required to own an apartment or multiplex. Additionally, owners are typically required to pay for some utilities, maintain common areas, and perform all the day-to-day management tasks (e.g. collect rent, find new tenants, fix garbage disposals, etc). The other major downside that comes with multifamily properties is the lack of diversification. Although you own all of the units within an apartment building or multiplex, all of your eggs are essentially in one large basket. You are limited to one market/neighborhood and one local economy, which increases your risk. There is an alternative to multifamily real estate that avoids the downsides and lets you take advantage of the same great benefits – single family rentals (SFRs). When you invest in SFRs, you can literally build a multifamily investment portfolio one door at a time, also known as building a virtual apartment. This allows you to reap the benefits of cash flow, leverage, and appreciation without the downsides. Lower Point of Entry: Single family rentals are less expensive to purchase than a multifamily. Multifamily buildings come with a large price tag and a big financial commitment. Instead of tying up all that capital in a single asset, you can build your real estate portfolio one door at a time. Using the profits made from your first SFR, you can purchase a second property and subsequent properties down the line as profits increase. Diversification: Owning several properties in different markets protects you from the ups and downs of that specific market’s economy. For example, if you owned an apartment in one area in which the town’s major employer closed it’s doors, vacancies could quickly become a huge problem. By owning properties in multiple markets, you won’t be putting all of your eggs in one basket. This means that cash flow will still be coming-in from other properties, even if there is a vacancy, which minimizes your risk. Increased Demand For SFRs: Most renters prefer to own a home over living in an apartment. This provides the renter with additional flexibility and more privacy with no shared walls. Lower Monthly Maintenance Costs: Unlike an apartment building, there aren’t any common areas such as clubhouses, gyms, or pools that you are required to maintain. Furthermore, tenants are responsible for paying for utilities like trash, electricity, and other expenses. One of the main reasons investors want to own multifamily real estate is because they can manage it themselves or only need one property manager. With HomeUnion® there is a better way to invest in residential housing, as we manage the entire SFR investment portfolio for you. Thus all your SFRs, no matter where they are located, are fully managed just as all the “doors” of a multifamily apartment would be. Our data scientists and local market experts use proprietary analytics to find solid investment properties from the 110 million single family properties across the U.S. We’ll present you with a custom portfolio based on your financial goals. We do all the legwork to acquire an investment property including: identifying funding options, making intelligent offers, researching insurance options, and managing the inspection and appraisal process. 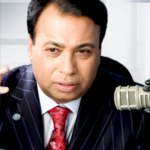 After acquisition, we manage all the day-to-day details of the assets to maximize returns. Services include: finding solid tenants, collecting rent, handling the payment of expenses, performing all maintenance, and depositing rent into the investor’s account. 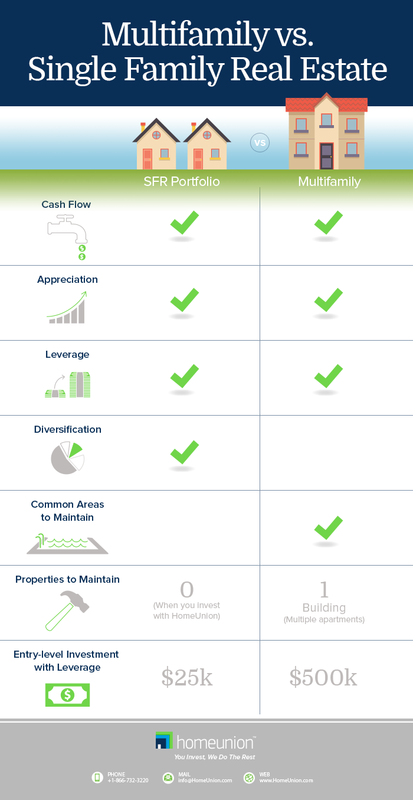 Investors can easily track the performance of their assets via the HomeUnion® Investor Portal. Additionally, data can be easily exported for inclusion in an overall portfolio. When ready, we make it easy for investors to sell their performing assets by making the property available to our ever-growing pool of investors. Whether you are looking to build a portfolio of dozens of properties or planning to start with just a few, HomeUnion® is here to help. We’re helping investors just like you achieve their financial goals through single family rentals and we are making the process easier than ever. 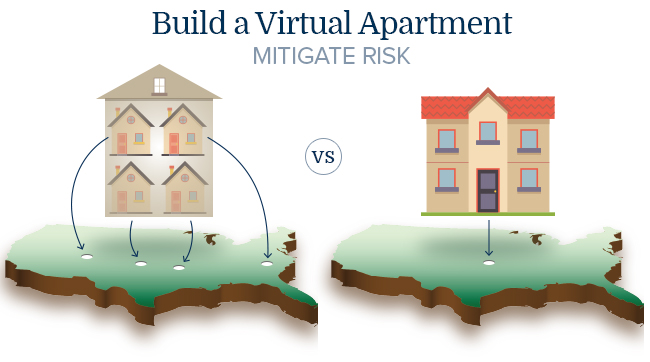 What is a Virtual Apartment Building? I own rentals, I would like to try something like this...but I don't understand it. I have 10 duplexes and would like to put them into a system like this...maybe. My home country is Tanzania ( East Africa). I do own some apartments. Can I join to your system ?